HCM CITY — With people returning to HCM City from the Cửu Long (Mekong) Delta after Tết (Lunar New Year), highways have been severely congested in the past two days. National highways section in Tiền Giang Province has experienced relentless congestion since Friday, with traffic mostly crawling on National Highway 60 from Bến Tre Province. National Highway 1A sections in Vĩnh Long Province have been similarly congested since early Saturday morning. Traffic through the Rạch Miễu Bridge has been stop-go since Saturday though the toll booth at the bridge has shut down many times to ease things. 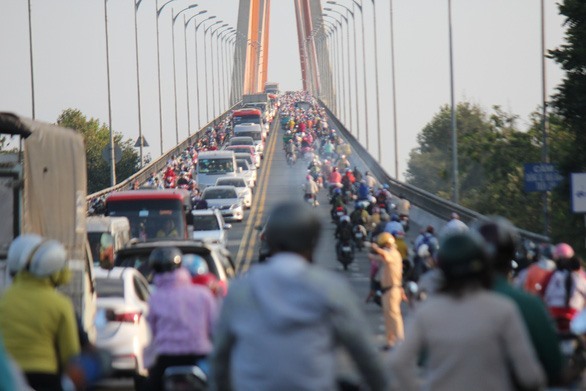 Many travellers are resting and taking photos on the Cần Thơ and Mỹ Thuận bridges, exacerbating the traffic chaos.